How do you impact culture in a way that makes it do an about face? Marketing is charged with shaping the opinions of people to purchase a product or a service, to feel good about a company, a brand, an industry; craving one thing and rejecting another. There is no better example of this than the marketing of cigarettes. The culture that grew up in the first half of the twentieth century was marketed to embrace smoking as debonair, strong, relaxing and even healthy. In the late 1950s, studies began to link cigarette smoking to cancer. In 1964, the US Surgeon General came out with the first of several warnings linking cigarette smoking to major health risks. Of course there is nothing at all debonair, strong, relaxing or especially nothing healthy about a lung cancer victim struggling for a breath of air. It took many years, but the culture shifted in the way it viewed cigarettes. There was a stigma that was attached to cigarette smoking and this message changed drastically. It happened the same way that tobacco companies had attracted people to smoking in the first place: it took marketing. When you have a strong marketing message, it has a grand impact on the way people think. Attitudes shift. When you are marketing well, you impact this shift. 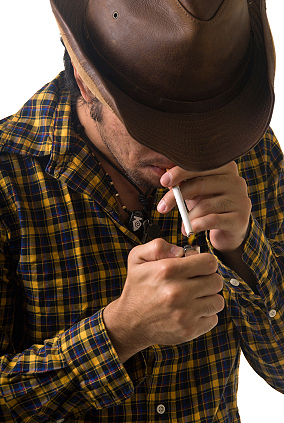 In my generation, one of the most successful cigarette campaigns was that of the Marlboro Man. It is amazing that just the mention of a brand of cigarettes coupled with Man conjures up the images of the independent cowboy that so appealed to men. Smoking was a willful act of an independent man. No one was going to tell the Marlboro Man to put out his cigarette or he wouldn’t be served in a restaurant. He would just cook beans over an open fire and smoke on his own. When the first campaigns against smoking began in the 60s, this was just the argument that those on the side of smoking made against their rivals. Leave us alone, we are freedom-loving citizens who will smoke when and where we like. Those in charge of Philip Morris’ marketing efforts had to be smiling. They had not just created a spokesman for their product, they had shaped the attitudes of their customers. In shifting attitudes, the anti-smoking marketing appealed to this sense of liberty and challenged it. They claimed that big tobacco companies had made slaves of its customers, not liberated them. They vilified these corporations. They claimed that they solicited children to smoke by advertising directly to them in their early teens. The anti-smoking campaign used this to get smoking ads and sponsorships banned, first from TV, then from sporting events, then from billboards, and so on. After taking away these mediums of advertising, the anti-smoking campaigns then used these very mediums to shout their message even louder. In this way, they used very powerful marketing tools to turn the public’s perception of smoking. In the book, Smoke: A Global History of Smoking, the authors state, "Perhaps one of the more interesting aspects of smoking is not that it is stigmatized, but rather that it seems to have changed its place in society significantly. What once was behavior touted as a sign of gentility and sophistication is now portrayed as foolish and unkempt.”* The anti-smoking marketers made a very strong statement by using the very same pitchmen who pedaled cigarettes years earlier to now pitch a different message. Before he died of lung cancer, Yul Brynner did a TV commercial where he stated, "Now that I'm gone, I tell you: Don't smoke, whatever you do, just don't smoke.” Even the Marlboro Man, Wayne McLaren, did an anti-smoking campaign just before his death at age 51, juxtaposing photos of himself as the strong Marlboro Man with film of him lying in his hospital bed after the removal of a lung and chemotherapy had reduced him to a shell of his former self. Marketing can turn the tide of cultural attitudes. Don’t underestimate the message you are making in your campaigns. * Smoke: A Global History of Smoking, Sander L. Gilman and Zhou Xun. Reaktion Books, London. p. 348.